I happened to be checking out the Centennial H.S website to see what kinds of things are going on there, now that my nephew is a freshman there. I graduated in 1989 and was part of the band “scene” for all four years. I noticed that there was a link to the bands and was curious. While looking at the Alumni page I saw you had 5 pictures posted that you didn't have any information on. Well, lo and behold I was definitely part of 2 of them and I think the third was from a year after I graduated, only because I can recognize one of the trumpet players (Keith Oye) and that would have been his Sr. year (1990). I can give you information on the group photo (black and white). I almost didn’t click on the thumbnail because I thought it would be really “old”! Anyway, here is the list of students, location and group (and boy did it bring back memories!). 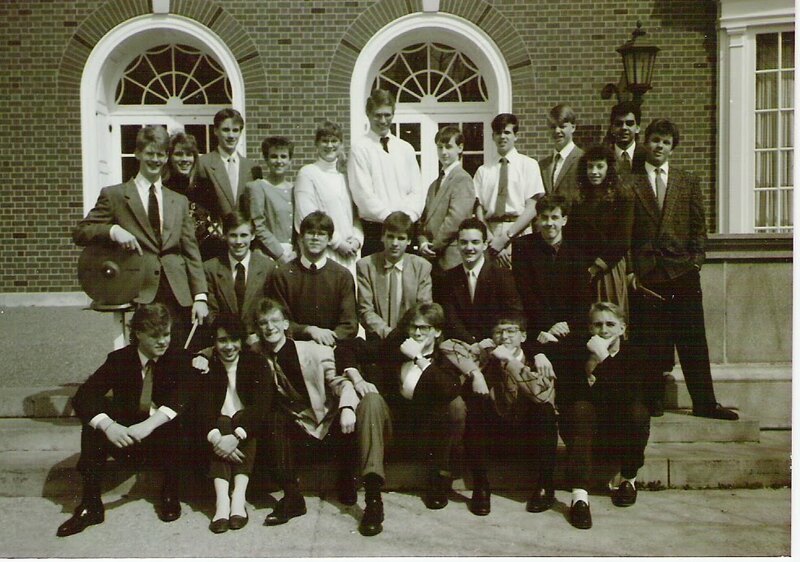 The group photo was of the Centennial Jazz Band I, taken outside of the Illini Union after a Jazz competition in 1989. Mr. Joe Wolfe was the director. Soon after this picture was taken, we went on to compete at the National Jazz Competition in Philadelphia, Pennsylvania. List of names bottom to top, left to right… (I had to drag out the dusty yearbook for exact names and spellings…) (bottom): Josh Walden, (bass), Rachel Palencia (sax), Dave Lehnus (sax), Scott Dreher (sax), Daniel Lee (sax? ), Kip Musson (sax? ), (second row): Mike Creason (drums), Jon Schmidt (trombone), Steve Hoffman (trombone), Todd Kine (trombone), (? ), Chris Doll (trombone) (his mom was a counselor at Centennial when I was there), (third row): Amy Webbink (piano), Jeff Schmidt (trumpet), Cari Cicone (ME ~ trumpet), Jenni Black (trumpet), Keith Oye (trumpet), Tim Meeker (trumpet), Randy Gawthorp (trumpet), Richie Curtin (trumpet), Kevin Badertscher (percussion), (down a step) Jenny Evans (percussion), Mike Stellwag (drums). The third photo I mentioned (the marching band on the cobblestone street) I think was taken in 1987 (the year we got new uniforms). Not for certain. It is hard to see the faces, but I think I can recognize one of the trumpet players (Jason Whiteside). He moved away in the spring of ’88. Well, thanks for bringing back the memories! I hope to see other archival photos up on this site. It is great to see them again!